Geloof ‘t of niet, maar Michiel Leezenberg geeft komende zondag in Teheran, Iran een lezing over Spinoza en Islamitische filosofie! Zie daarover hieronder het bericht dat Iran Book News Agency enige uren geleden bracht. Volgens dat bericht zou hij gaan spreken over 'Spinoza and Islamic Philosophy', maar op de website van het Iranian Institute of Philosophy in Teheran staat het onderwerp aangekondigd als: 'Spinoza as an Islamic philosopher'. Vandaag (over een half uur) geeft Ali Moazami (van het IRIP instituut zelf) een lezing over: 'Leo Strauss on the Art of Writing'. Dr Michiel Leezenberg, professor of philosophy at the University of Amsterdam is going to lecture on 'Spinoza and Islamic Philosophy' at Iranian Institute of Philosophy. IBNA: According to the Public Relations of the Iranian Institute of Philosophy, this session will be held at 10:00 o'clock of Sunday 22 May 2011 at this institute. 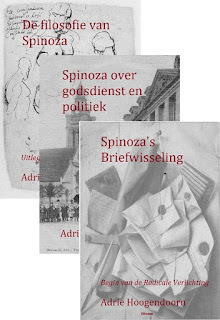 Baruch de Spinoza is one of the most important philosophers of the 17th century and a pioneer of religious criticism and the enlightenment period of the 18th century. "Ethica", his most important book that was published posthumously, challenges Cartesian dualism. Philosopher and historian Georg Wilhelm Friedrich Hegel said of all contemporary philosophers, "You are either a Spinozist or not a philosopher at all." You can attend this lecture at the Iranian Institute of Philosophy – located at No. 4, Shahid Arakelyan Street, Neauphle-le-Château Street, Valiasr Avenue, Tehran.